Ever since I first discovered the mysterious karaoke add-on for the Dreamcast, I knew I had to have one. 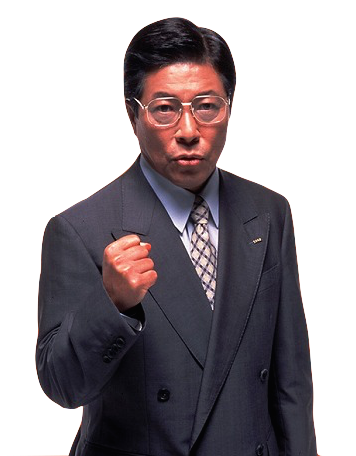 I have spent years scanning eBay and forums looking for a reasonably priced unit, and even enlisted the help of DCGaga at one point, reaching out across the ether to see if it would be possible to have one purchased and shipped to the UK from the distant shores of Japan. Ultimately, the price of surface shipping and the lengthy wait put me off (although I'm thankful for the assistance! ), and so I went back to searching auction sites and retro 'for sale' groups. Occasionally I did spot a unit on eBay, but the sellers wanted extortionate sums; and I even discovered a shop in the UK which had one in stock...but again the pricing seemed a little exorbitant for my (admittedly shallow) pockets. The problem with collecting obscure items for any system is usually an issue of price and trying to accurately determine whether the thing you're searching for is actually worth the equivalent of a months' wage. 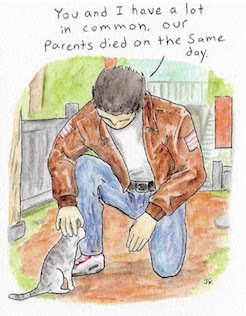 In many cases it really isn't, and this particular story could have ended in the same way countless others have - with me splashing out money on something I couldn't really afford and had no real need for, other than morbid curiosity and being a complete sucker for anything even remotely Dreamcast-related. We all have our vices, and things like cigarettes and alcohol are clearly on a different level to collecting retrogaming hardware and software, but the similarities are plain to see. It's more a desire to feel that buzz when you finally land the previously unattainable, and the addiction factor of knowing you just have to have that add-on or peripheral or game can be as destructive as either of the aforementioned. But before we get too dark, let's turn the brightness back up: I managed to bag a boxed Dreamcast Karaoke Unit for £40 in an eBay auction! It took me several years, but I finally got my prey. The question is: was it worth the wait? In a word: No. In several words: No it was not. But before I get into the reasons for that damning expose, let us take a little look at the aesthetics and history of the unit. 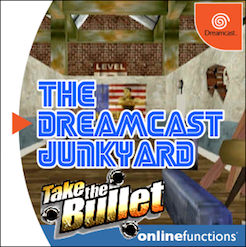 The Dreamcast Karaoke Unit is the only add-on for the console that sits underneath the main console and takes advantage of the little 'hook' points on the bottom. Using the section on the rear-right, the add-on 'docks' with the Dreamcast through the modem/expansion point, and then allows you to place your existing modem (or Broadband Adaptor, if you're lucky enough to own one) on the identical port on the bottom of the Karaoke Unit, and this is critically important for reasons I shall reveal a little later in this article. 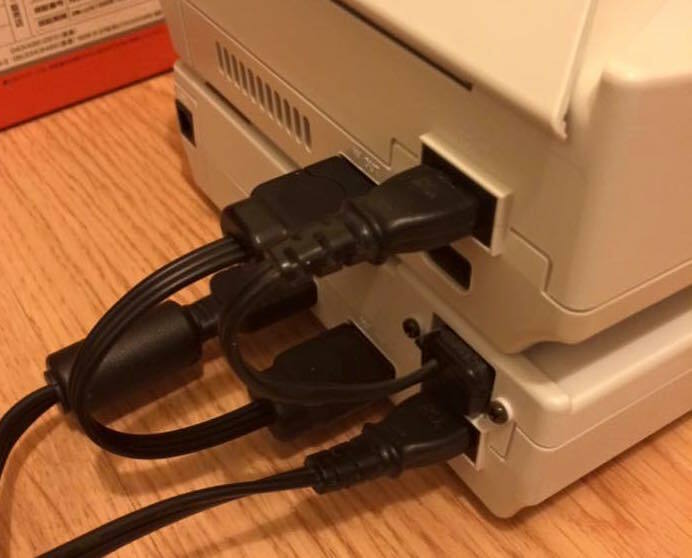 The unit is further connected to the Dreamcast via a short connector cable and a power cable, and then you plug the Dreamcast Karaoke Unit into the mains. As it was only released in Japan, the unit can only be used with a step-down converter (if you aren't in Japan, obviously), and I haven't had the inclination to open the thing up to see it it will take a UK power board like the main consoles will. Lastly, in order to use the Karaoke Unit, you'll need to connect it to a TV using the 'A/V Out' socket, and here's the first odd thing I ran into - the Karaoke Unit doesn't output either an S-Video or VGA signal. Indeed, all of the images in the manual (see above) clearly depict a composite cable and I haven't been able to test it with an RGB Scart connector at the time of writing. I just thought this was a bit strange and worthy of mentioning here in case you bought one of these things and tried to connect it using either VGA or S-Video. All you'll get with those is a black screen, which is very odd. 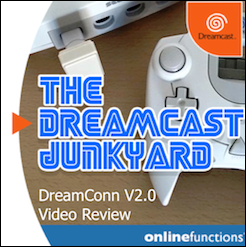 Even in the face of this shortcoming though, it cannot be denied that the set-up looks extremely cool and gives the Dreamcast a somewhat beefed up appearance - almost like the N64DD. 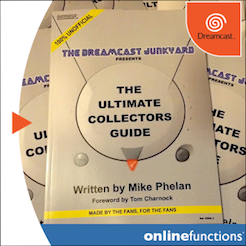 In the box with the unit comes a Dreamcast-branded microphone (complete with a 1/4" standard jack), a manual, stickers for the microphone and a guide book that gives numbers for the songs that you are meant to use on the system. 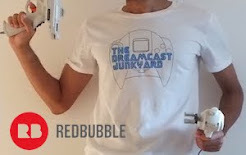 The fact that the thing comes with a single microphone is a little strange as you'd expect this kind of peripheral would be perfect for parties (well, in 2001) and I've never seen a single Dreamcast mic for sale. That said though, it's possible the standard jack was incorporated so that any old mic could be used. 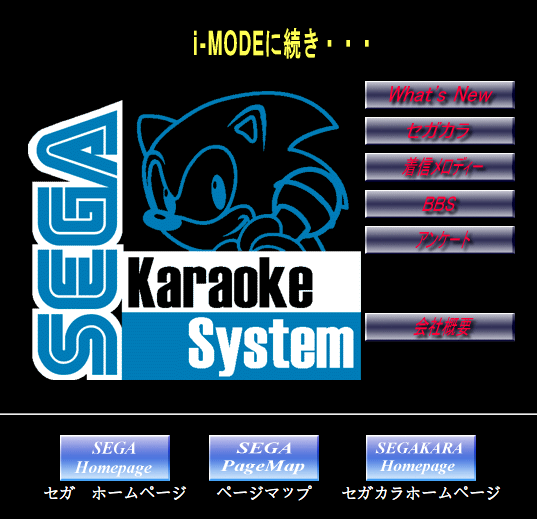 Also bundled with the hardware is a Sega Kara GD and it's with this software that the Dreamcast is able to 'see' the Karaoke Unit and open up a world of drunken sing-alongs. 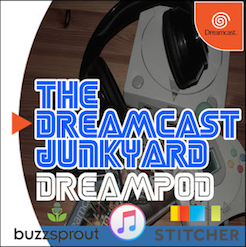 Without the disc, the Dreamcast doesn't even register that there's another piece of hardware stuck to it and will happily function like a standard console, albeit one with a million wires sticking out the back. And here's where the whole thing falls apart. 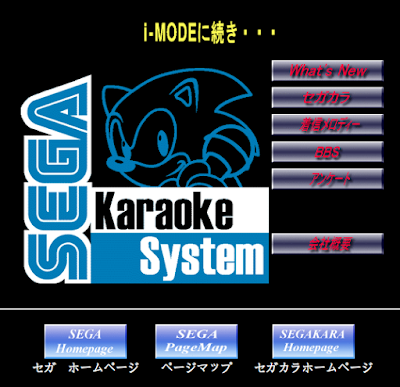 See, the Sega Kara software was intended to act as a sort of 'portal' whereby you were meant to use the bundled song directory to tap in numbers for the song you want to sing, and via the power of the internet the modem would connect to the Sega servers and download the file and allow you to sing along while the words scrolled up the screen. It seems that the Dreamcast Karaoke Unit was far from Sega's first foray into the world of home karaoke technology and there are a few pages showing download charts and other bits of compatible hardware (the 'Super Prologue' range is shown above) that would allow Japanese consumers to log on to the web-based service and download songs to sing in the comfort of their own homes. 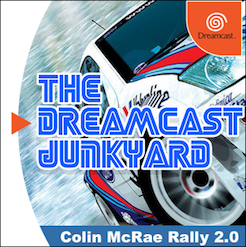 I would image that these were also capable of playing compatible CDs too - something which the Dreamcast Karaoke Unit is sadly not able to do. 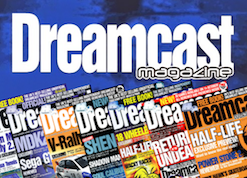 Either way, these pages offer a fascinating glimpse into an almost hidden past and show just how big Sega's plans for the Dreamcast were in Japan. 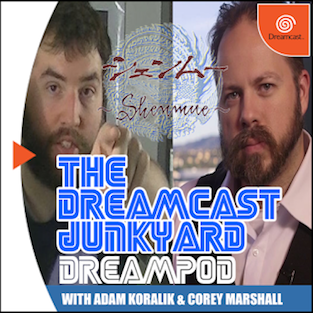 In the harsh light of reality though, the Dreamcast Karaoke Unit is ultimately a useless item that is one for collectors only. I'm really glad I finally got my hands on one and have been able to investigate the unit in a more authoritative manner than I would have if I'd just been reading articles or watching videos; and I'm also really glad I didn't pay the ridiculous sums I've seen these go for. Also, rumours that you can use the Sega Kara disc to play some sample songs are - as far as I can tell - completely untrue so if you do buy one of these, expect to be buying an ornament or a curiosity and you will not be disappointed. Buy one expecting to be singing ABBA on it on a Friday night after too many Piña coladas though, and you'll be wondering what you spent your hard earned money on. Aha! I knew that those little Mega Drive-esque horizontal slots had a purpose. When I was stripping my DC down yesterday I did speculate to myself as to whether or not they'd be used for the karaoke unit or the proposed Zip drive. Nice piece Tom, but what an anticlimax. Disappointing that it's now simply a glorified paperweight. 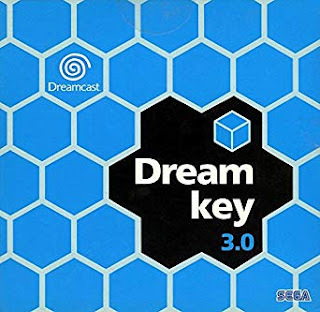 It seems kind if shortsighted that no media came packaged on the disc, but then again, even if the Dreamcast hadn't failed, I bet Sega weren't planning for people to be still using the Kara in 2015. The microphone that connects to the controller for use with Seaman has a different size of jack and isn't powered like the karaoke mic. I guess if you used an adapter the Seaman/Planet Ring may also work in the Karaoke Unit, and vice versa...but why would you want to use the smaller mic on the Karaoke Unit or the bigger mic with Seaman? That's an interesting way of utilising the hardware. I'd like to keep this one as it is for preservation, but if I ever come across another it's something I will certainly consider! It didn't come with a plug as I guess Sega assumed you would just use the one you already had for your Dreamcast. But yes, as pictured the unit is connected to the wall socket and the power is fed into the Dreamcast via the little power cable that goes into the console. 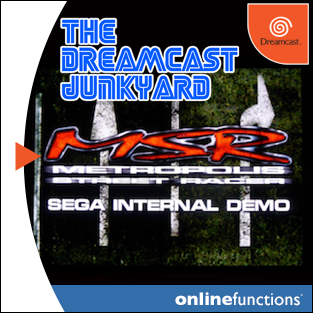 "rumours that you can use the Sega Kara disc to play some sample songs are - as far as I can tell - completely untrue"
Many DLCs for Dreamcast (e.g., Samba de Amigo songs) were actually very small files to be stored in the VMU, so the actual content (already on the disc) would be "unlocked" by the game when it sees the file on the VMU. Anyway, did you check the contents of the disc? BTW, it would be interesting if you could provide scans of the manuals and song lists - I could only find a handful on Sega Retro. And, since you have nothing to lose, why don't you mess around with the VMU file for Sega Kara? 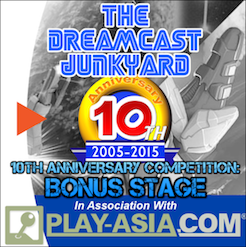 From what I saw it requires 60 blocs on the VMU... I would definitely try to check and edit the contents to see what happens. Hi Ricardo, thanks for your comment. 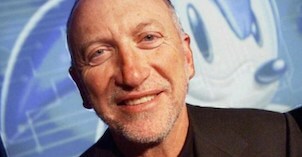 Interesting point - I can't remember if I actually tried looking on the Kara disc using my computer. Will give that a go. Also, I'll look into the VMU file. 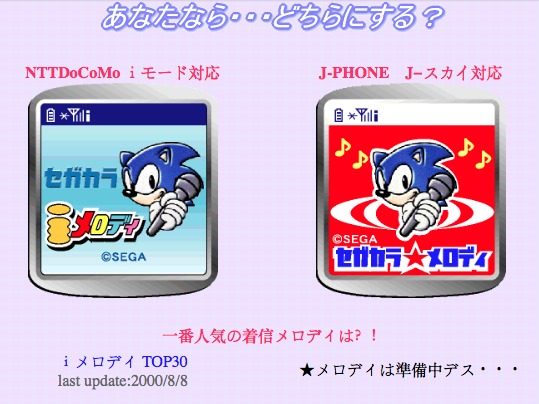 The scans on Sega Retro are actually of the unit I have - I scanned them and sent them to Doc Eggfan to upload! The manual with the song lists is about 200 pages thick though but I'm happy to scan selected pages and get those uploaded too. - The disc image I got support the VGA box. - There are 123 background videos in .m1v format (MPEG-1, no audio, 256 x 176) on the root of the disc, providing about 4h14 of background and accounting for 602 MB of the 663 MB total content size. 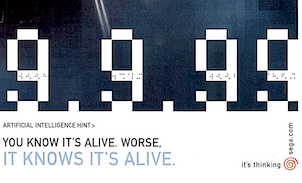 - There is one .ASF file containing 401 .ADX files. I guess some of them are samples for reproducing midi files and/or other audio data, but most of them seem to be something else. - Many other folders and files are for the Dream Passport 3. - Five other files with name M030000 and extensions: .A, .CMP, .STN, .TBG, .TRP. In total, they have 37.3 kB. 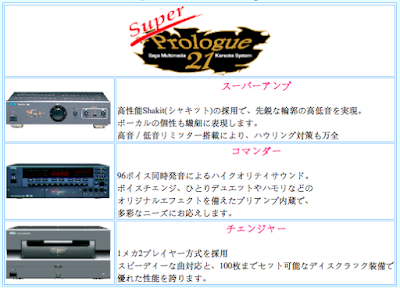 - SUPER.A, with 14.6 MB, is a song database. I wrote a small script to parse it, and it contains 15.751 song entries. For each song there is the title, singer, songwriter, composer, one line of the lyrics and more. 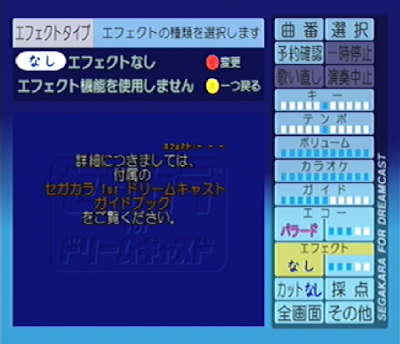 - There seems to be only one midi file in the disc: JINGURU.MID, with 90 KB, but it won't play with QuickTime or VLC, and when Windows Media Player plays it I hear only a brief chord.